Add your own fields to your member records. These fields can be shown on the members tab and can be set to be either visible by administrators only or visible by the whole group. Note: See the Admin only and Member editable options below. You must be an administrator of your group. Click on the Group Tab and open your group details. Scroll down to the Custom Member Fields option and click on Change.. Note that if you have already defined some fields they'll be available for editing here. These fields are used to record information for a member that is for administrators' eyes only. This information is therefore not visible when logged in as a non-admin. To make a field admin only, you just need to tick the 'Admin only' checkbox. 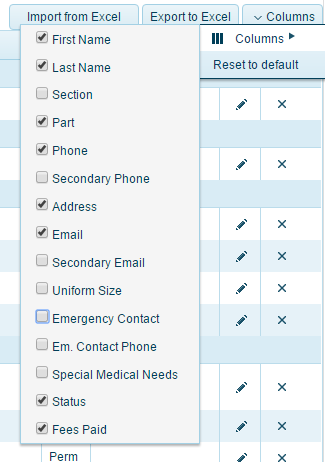 By ticking the 'Member editable' option, you can give your members the ability to edit certain fields. This is useful if you'd like them to keep this information up-to-date. You need to record which members have paid their fees for this year. The best field type for this is a yes/no field, so when you or another administrator enters the data you just need to select yes or no. Be sure to tick 'Admin only' so that only administrators can see this information. Adding a default is optional - you may consider setting it to yes if most people have paid and you only want to update it for those that haven't. With the above example entered, it'll be presented as an option along with the standard fields when you create or update a member. You can also change which columns show in the members tab. This is useful if there are fields you don't use or you want to include custom member fields you've created. To make these changes, open the members tab and click on the 'Columns' button on the right at the top of the members table. All Custom Fields form part of the import and export to Excel. An easy way to load custom field values to existing members is to export to Excel, add the values in the spreadsheet and then import again.